The ASM materials experience at BU was an all-day event held here at BU in which about 60 local high school students visited BU and learned about materials science and engineering. High school student groups, led by a graduate student volunteer, visited 6 different modules throughout the day. Each module was led by an industry volunteer from the Central or Eastern Massachusetts ASM chapters, and assistance was provided by graduate student volunteers. Held on May 22nd, 2017, the BU ASM Materials Experience Day 2017 was an all-day event in which about 60 local high school students came to BU and learned about Materials Science and Engineering. Student groups were led by a graduate student volunteer, and participated in 6 modules, which were led by local ASM Central Massachusetts Chapter industry members and helped by other graduate students. In all, about 15 BU graduate students helped. The event was quite the success! All student groups arrived safely, and participated in every module throughout the day. In addition, high school students got a tour of the BU College of Engineering, hopefully encouraging them to pursue further education in the engineering field. Thank you to all the students and volunteers! Once again, BU is hosting the ASM Materials Experience, which is an event where high school students from the greater Boston region come to learn about materials science concepts from industry professionals, get to meet materials science students and researchers (you! ), and have some fun! If you are unfamiliar with the event, more information is available at the ASM Materials Experience page and on their flyer. This years activities have included our annual spring Materials Day, as well as an MSE colloquium presentation and open career discussion with graduate students with Prof. Diran Apelian of WPI. Materials day was earlier this spring, and was once again a wonderful experience for both the visiting high schoolers and the ASM volunteers. The high schoolers spent the whole day at BU, participating in modules run by ASM industry members such as cryogenics, batteries, metal forming, and shape memory alloys, among others. We look forward to hosting this event this upcoming spring as well. The highlight of Prof. Diran Apelian’s visit for several students was definitely the open career discussion, as many of us spent 2 hours having lunch and a free-flowing discussion with Prof. Apelian about career goals and how to achieve them. 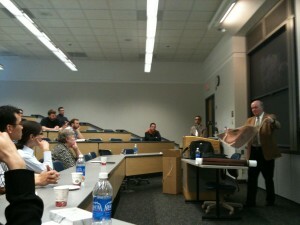 Professor Apelian’s colloquium presentation was well attended and garnered many questions as well. Considering a career in industry? Interested in Start-ups? Want to learn about what steps you need to take? Curious about what kind of struggles those companies go through? Come chat and ask questions from experienced and successful engineers from start-up companies! XRpro is a company developing x-ray fluorescence technology and successfully applied it to early stage drug discovery. Co-sponsored by SAGE and the Division of Material Science and Engineering. Are you considering a career in different areas? Trying to decide where your research interests and career goals might be most well-suited? Come ask questions from experienced and successful engineers from industry! BUASM has organized numerous Career Panels in the past with attendance of 50+, to provide students with the opportunity to explore these issues and plan for their careers. Panel will begin with a moderated discussion of their early careers and education, followed by a question and answer session from the audience. Come join us (RSVP early for free food), learn more and start planning your life after BU! Loucas Tsakalakos is the Manager of the Photonics Laboratory within Electrical Technologies & Systems, Micro & Nano Structures Technologies Organization at the General Electric – Global Research Center in Niskayuna, New York, USA. He received his BS degree (1995) from Rutgers University, and his MS (1998) and PhD (2000) degrees in Materials Science and Engineering (with minors in Solid State Physics and Microelectromechanical Systems) from the University of California, Berkeley. His expertise is in the integration of heterogeneous thin film and nanostructured materials systems for micro- and nano- device applications; he also has extensive experience in the characterization of materials. Since joining GE Global Research in 2000, Dr. Tsakalakos has designed and implemented integrated electronic and sensor systems for defense applications, studied cathode materials for lighting applications, and is a founding team member of GE’s Nanotechnology Program. His major area of research within that program was the development of nanostructured materials and devices, primarily using nanowires/tubes, working with multi-disciplinary teams both within GE and in collaboration with external partners. Loucas subsequently led the Advanced/Next Generation PV efforts within GE Global Research’s Solar Energy Platform. Most recently he worked within GE Energy – Solar Technologies and led a PV Module Product Engineering team at GE Global Research, where he designed, optimized, and led cost-out efforts for CdTe thin film solar modules. In his current role as manager of the Photonics Lab, Loucas leads a team of 12 Ph.D. and M.S. level scientists and engineers developing advanced photonics technologies for data communications, sensing, and novel photonics applications. Dr. Tsakalakos is a member of Tau Beta Pi (The National Engineering Honor Society), is author or co-author of over 30 journal, conference proceedings, and book chapter publications, and holds 12 U.S. patents. He has given over 40 invited presentations at international conferences, symposia, and other events. She joined Saint-Gobain in 1992 as a Research Engineer in the Northboro Research Development Center of Saint Gobain (corporate R&D center in the USA). Dr. Hardy has held various positions within the Saint-Gobain R&D organization working with ceramics, polymers and construction products. She took her current position in October 2010. She has a BS in Chemical Engineering from University of Utah and a PhD from MIT in Material Science. Steven Tobias is Director of US Strategy for National Grid and was previously Principal Analyst within Group Technology and Innovation. National Grid is international electricity and gas company and one of the largest investor-owned energy companies in the world providing energy to millions of customers across the northeastern U.S. and Great Britain. Prior to joining National Grid, Mr. Tobias was part of Navigant Consulting’s Energy Practice within their Energy Research and Technology Management team primarily working with companies and organizations in the electric and gas utility sector. Mr. Tobias is a graduate of MIT’s Department of Materials Science and Engineering with bachelor’s and master’s degrees. Curious about what it’s like to work in engineering in industry, government research, consulting or a start-up? 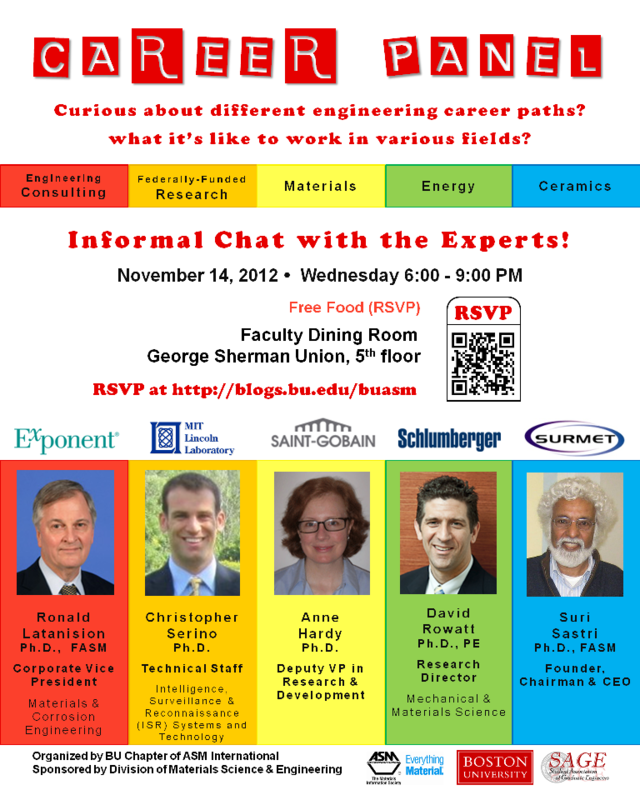 Want to speak directly with experts in their field about different career paths? Prior to joining Exponent, Dr. Latanision was the Director of The H.H. Uhlig Corrosion Laboratory in the Department of Materials Science and Engineering at M.I.T., and held joint faculty appointments in the Department of Materials Science and Engineering in the Department of Nuclear Engineering. He is a member of the National Academy of Engineering and a Fellow of ASM International, NACE International, and the American Academy of Arts and Sciences. He was a founder of Altran Materials Engineering Corporation, established in 1992. Dr. Latanision is a member of the International Corrosion Council and serves as Co-Editor-in-Chief of Corrosion Reviews. Dr. Latanision’s research interests are focused largely in the areas of materials processing and in the corrosion of metals and other materials in aqueous (ambient as well as high temperature and pressure) environments. He specializes in corrosion science and engineering with particular emphasis on materials selection for contemporary and advanced engineering systems and in failure analysis. His expertise extends to electrochemical systems and processing technologies, ranging from fuel cells and batteries to supercritical water power generation and waste destruction. Dr. Latanision’s research interests include stress corrosion cracking and hydrogen embrittlement of metals and alloys, water and ionic permeation through thin polymer films, photoelectrochemistry, and the study of aging phenomena/life prediction in engineering materials and systems. Dr. Latanision has served as a science advisor to the U.S. House of Representatives Committee on Science and Technology in Washington, D.C. He has also served as a member of the Advisory Committee to the Massachusetts Office of Science and Technology. Dr. Latanision has served as a member of the National Materials Advisory Board of the National Research Council. In June of 2002, Dr. Latanision was appointed by President George W. Bush to membership on the U.S. Nuclear Waste Technical Review Board, a position in which he continues to serve in the Administration of President Barack Obama. Thanks for everyone who showed up. Welcome our new officers! 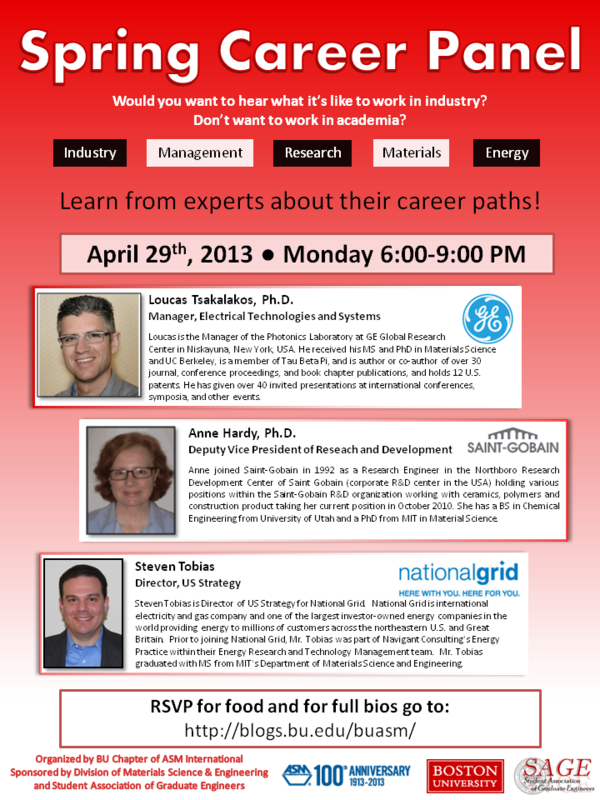 And look forward to the upcoming Career Discussion Panel event. Our partners at the ASM Boston chapter are having their final meeting of the season next Thursday at the Hyatt in Cambridge. Dr. Larry Kaufman, President, CALPHAD, Inc.
$15 for ASM Student Members (email asmboston-at-yahoo.com for reservations). Click here for the event flyer (PDF). 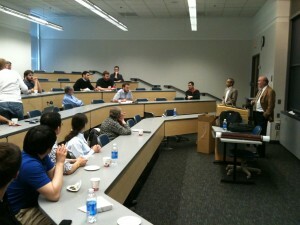 On April 22, 2011 the Boston University ASM chapter in conjunction with the MSE Colloquium series brought Dr. Richard Childers of Konarka Technologies to campus for a presentation on organic photovoltaics. Information about this inaugural event can be found below.